Making it Home: Mmmnnn... Grilled Pizza! That looks soooo good. Where do you get that Wolfgang P. dough? WOW that looks SO goooood!!! And by the way, your backyard is beautiful! Basil, goat cheese and caramelized onions! 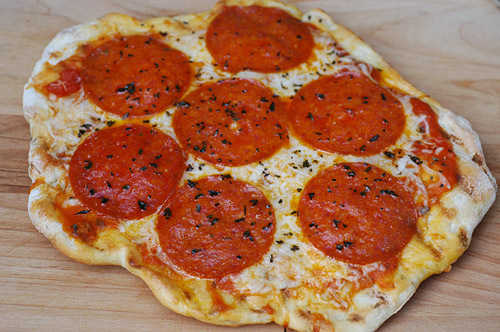 Can't see myself making homemade dough but that's a great topping combo - have to try it! oh my gosh this looks so delicious. I'm going to have to try that...yummmy!